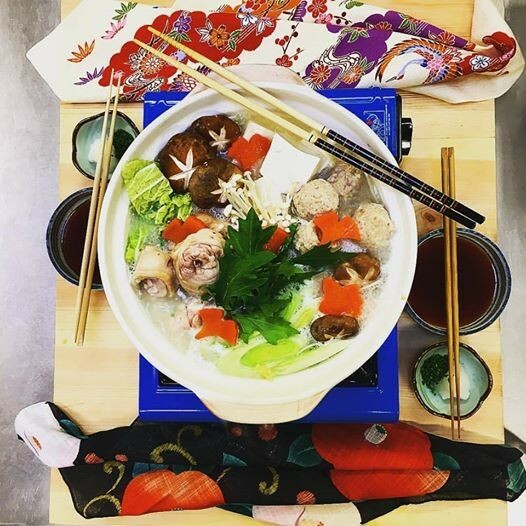 This one-pot chicken recipe is a dish from my home town Fukuoka – chicken pieces and vegetables stewed in a milky stock, and eaten with dipping sauce such as ponzu. Mizutaki is served during the colder seasons. In modern Japan, it is kept hot at the dining table by portable stoves. The dish is frequently cooked at the table and the diners can pick the cooked ingredients as they want from the pot. It is either eaten with the broth or with a ponzu dip. Enjoy this family dish at the table. 1. Place water, chicken bones and carcass into a pot and bring to a boil. 2. Using a ladle, skim the surface of the water until soup is clear. 3. Add the kombuto the soup and keep it boiling for 3 hours on a low heat. 4. Keep adding more water until the soup turns white, then sieve the soup. 1. Place the minced chicken, salt into a bowl and mix well until the chicken is well-coated and sticky to touch. 2. Add the leek, egg, ginger juice and light soy sauce, and mix well. 3. Add the sake, potato starch and combine well. 4. Scoop the mixed mince into small balls and place into gently boiling water. 5. Cook chicken balls for 10 minutes. 6. Take the chicken balls out from the pot and leave them cool. 1. Mix the dark soy sauce, grain vinegar and lemon juice in the bowl. 2. Garnish each diners ramekin with grated mooli and chives. 1. Cut tofu into sixths or eighths. Rinse the hakusai in cold water, and chop coarsely. Rinse the mizuna in cold water. 2. Remove the stems from the shiitake mushrooms. Remove roots part of enoki mushroom. Cut the leek diagonally and slice carrot diagonally. 3. Soak the shirataki (mung bean noodles) in warm water for 10 minuets and drain. 4. Place milky soup and chicken thigh into the pot and bring to the boil. 5. When the chicken thighs are tender, add the prepared mushrooms, leek and carrot. Bring to a simmer. 6. Provide each diner with their own individual ramekin of ponzu, mooli and chives. 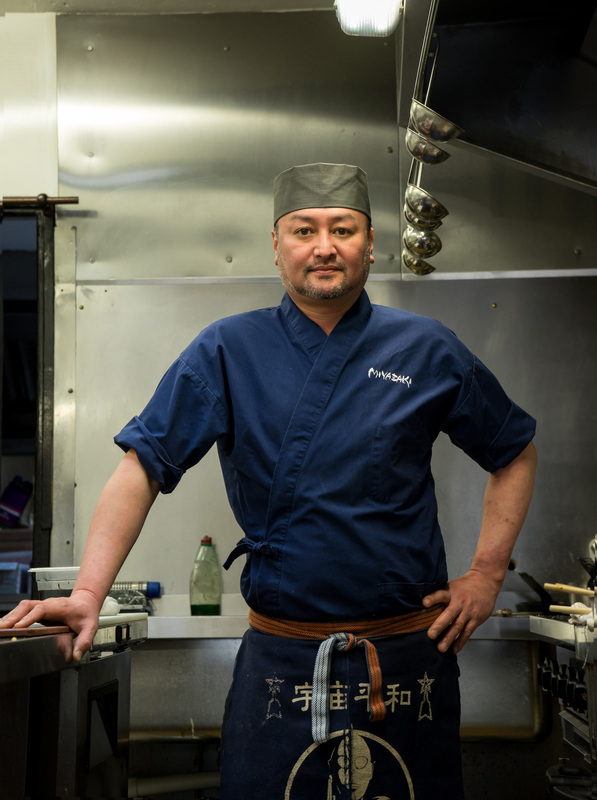 A native of Fukuoka Japan, owner and chef Takashi uses real Japanese elements in the food at his restaurant Miyazaki, in Cork.